Six COM and Six LAN with an LCD Control Panel? No Problem! A long-time customer recently came to us with a new networking project that required lots of Ethernet and serial port connectivity. Leveraging the MK150‘s LCD faceplate option and our assembly team’s ability to provide further customization at our facility, we were able to find a feature-packed solution. Getting six DB9 COM ports and six LAN ports was clearly going to be a challenge because it’s fairly specialized, and because of the amount of real estate required for all those ports. 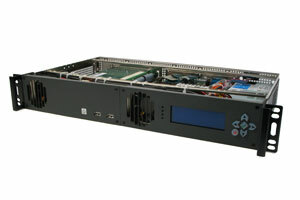 The LAN ports don’t take up too much room – four ports fit in one PCI bay, and many of our boards have two onboard. 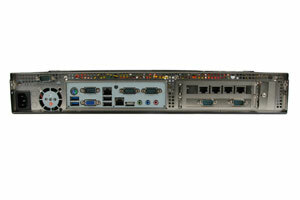 DB9 ports, though, are limited to two per PCI slot, and there are only a couple of boards on the market with two LAN and four COM on the rear I/O. The other obvious limitation was the LCD display, which can be difficult to integrate with a case that hasn’t been designed specifically for it, and none of those cases feature expansion slots. On the motherboard side, we opted for the Jetway NF99-525. This board has two Ethernet ports and only one COM port on the rear I/O (and one via onboard pin headers), but it is compatible with Jetway’s daughtercard system. 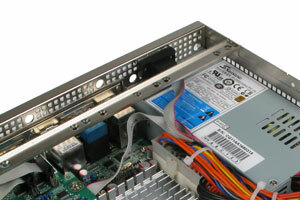 The AD4COMCB allowed us to add two additional COM ports on the rear I/O, and two via pin headers to a PCI blank. That still left us one COM port short, which is where our assembly team comes in: thanks to the additional height of the 1.5U form factor, they were able to punch an additional DB9 port cutout in the rear of the case, above the ATX power supply. Finally, we added the 4LAN network card and AKLCD-MK15X LCD faceplate with CrystalFontz LCD display to complete the system. If you’ve got a project that you can’t find a solution for, give our Technical Sales Team a call at 802 861 2300 ext. 1 to see what they can configure for you, or post your requirements below and we can get you started in the right direction.